The perennial cliché about the Central Coast is that it always ‘slips under the radar’ – but it’s hard not to describe the Mariners in any other way. Despite topping the table for most of the season, all the talk has been about other clubs, while recent discussion has only focused around the loss of Rogic and other impending departures. But Arnold has quietly assembled a Premiership winning squad that should cope well with the loss of their star players. As well as becoming the team to beat, their structure will serve them well in the Asian Champions League – and crucially, they’ve been able to rotate most of the squad, which will have freshened tired legs and left them primed for their end of season continental commitments. Graham Arnold has, predictably, kept with his conservative, counter-attacking system, with one major caveat – after two years with a diamond 4-4-2, Arnold switched to 4-2-3-1, despite originally suggesting it would be as a ‘Plan B’. But it quickly became clear that 4-2-3-1 was to become the Mariner’s default, despite a low scoring start to the season. Arnold was probably pleased by the tenacious combination of Nick Montgomery and Josh Hutchinson in midfield, which provided a secure platform for Tom Rogic to play a freer role as the creative playmaker. But the key is their well drilled two banks of four – the wide players get back quickly, and the two attackers – either two out-and-out strikers, or more predominantly, a poacher (Daniel McBreen) in combination with a trickier player (Rogic) just behind – play close to the halfway line, waiting for counter-attacking opportunities. It was the latter that started the first game of the ‘true’ post-Rogic era (as, at the time of his transfer, he was serving a suspension for the Victory game), and although that was a dull 0-0 draw with Newcastle, Caceres showed glimpses of talent with some clever touches in the final third, and frequently came deep towards the ball, which, as he can also play deep in midfield, was to be expected. He only lasted fifty-five minutes before being replaced by Nick Montgomery – as Arnold’s assistant Phil Moss was concerned with the threat of Newcastle’s quick breaks through the middle – but post-match Moss suggested Caceres simply ‘needs time’, and will be given more chances in the future. Indeed, the entire club seems enormously excited about the talent of the young playmaker – so much so, that Arnold briefly entertained the idea of knocking back the signing of Montgomery in favour of using Caceres in a deep-lying role – and whether he can make the step up to A-League football will be an intriguing story to watch. Of Arnold’s other options, Pellegrino, despite losing ten kilos in pre-season, has been hugely disappointing and was the first player hooked in the insipid 1-0 win over Perth Glory. Daniel McBreen was deployed behind Adam Kwansik in the 2-0 over Western Sydney but remains the best striker at the club and is better suited to the most advanced role, meaning Michael McGlinchey might move ‘into the hole’. He’s normally preferred on the right where he drifts inside to allow Pedj Bojic to storm forward, and the fact he can play on the flank means he plays a central winger, always looking to move out to the wing, particularly the left, where he helps create overloads with the overlapping Josh Rose. Also, in basic formation terms, he can play as an extra midfielder, which helps in tightly contested midfield battles. 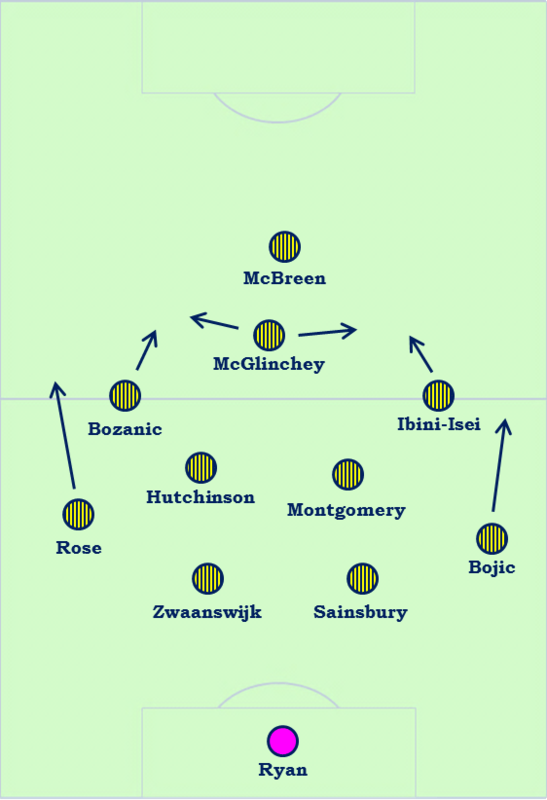 Playing with Kwasnik and McBreen verus Melbourne Victory left the Mariners vulnerable to overloads through the centre, and the difference after McGlinchey was moved centrally was markedly obvious. He was deployed there from the start against Adelaide United, and his constant link-up play with the wide players and vertical movement helped the Mariners completely overwhelm a weak Adelaide. “Every time he’s played at 10, we’ve done well,” Arnold said. “He gives you that drive and he’s great at finding space in there,” and on this enthusing praise, it seems likely McGlinchey will continue at 10. Ahead of him, the strikers’ role is simple – hold the ball up, defend from the front and poach for goals, something McBreen has done excellently this season. Arnold’s other options include the exciting talent Mitchell Duke – whose two goals sparked the turnaround against Adelaide – and Kwasnik, who plays on the shoulder and provides classic centre forward runs. New signing Nick Fitzgerald could also theoretically play as one of the front two, but looks likely to be used as a winger. Arnold needs defensively aware, hardworking players on the flanks – they don’t record particularly impressive defensive statistics, but their primary role is to drop alongside the midfield duo and form shape. After a poor start to the season, Bernie Ibini-Isei has evolved into a fine option on the left – although he played on the right against Adelaide – and offers pace and directness, particularly handy off the bench. Fitzgerald is a very similar type of player, and considering Ibini might be off to Belgium, the Mariners keenness to move forward his move makes sense. Another converted forward, Mile Sterjovski, is probably the weakest defensively and doesn’t provide enough protection to his full-back, while Oliver Bozanic is full of hard work and constant running, making him a good fit. Bozanic is also a handy option in the centre of midfield, and his more ambitious passing is a contrast to the more destructive habits of John Hutchinson and Nick Montgomery. There’s a slight overlap in roles there, but Hutchinson has more freedom to drop in between the centre-backs and find space to play out from the back. Neither is allowed to make forward runs however, and must keep very disciplined positions in front of the back four. That’s because the wingers are instructed to narrow in the centre, close to the no.10, which helps overload the centre and open up space for the fullbacks to advance. That’s important, because Rose and Bojic are highly aggressive defenders and bomb forward at every opportunity, having previously been required to provide the width in the diamond. Rose tends to become involved in attacking play frequently and is technically the better of the two, but Bojic is a very powerful runner and arrives later on in attacking moves, and also takes free-kicks in front of goal. If a side pins them back, the Mariners lose their drive from deep and play very narrow. Patrick Zwaanswijk and Trent Sainsbury have struck an impressive partnership, and Zac Anderson has proven to be a capable understudy. They sit deep to cover the advanced positioning of the fullbacks (creating a box in the centre of the pitch with the defensive midfielders), and frequently win the ball inside their own penalty area. Zwaanswijk is a fine passer and shutting him down is quite often the focus for opposition managers, but both Anderson and Sainsbury are capable of accurate long balls over the top, and the latter provided the assist in a crucial win over Perth early in the season. In goals, Matt Ryan is an assured starter (although he too might be on the move), and although his shot-stopping deservedly gets the most attention, he’s extraordinarily good at launching quick counter-attacks with long, flat drop-kicks. Arnold likes consistency and that is reflected in the overall stability at the club, despite upheaval every January. His starting eleven and approach may be easy to predict, but that doesn’t make them easier to beat. As the general summary suggested, there’s a lot to be said for being simply hard to beat – especially as it accounts somewhat if the team is playing badly. A mid-season dip in form should have been punished more severely, but a combination of strong defending and inspired goalscoring from McBreen makes them the obvious favourites. Mariners are a simple club with simple philosophies but simple as our game plans might be on paper, they work because of the quality of the individuals fit into each of the components of the system. For the likes of me, it’s been a lesson in how football can be played and from a fans point of view it is – well compelling. Things change quickly in football and Mariners fans are more than mindful of this, but at this moment, I can understand any jealousy of how the implementation of a great plan comes off in such a consistent way for my team.